Here are two new psychedelic offerings from the City of Brotherly Love (as displayed so prominently on the cover of the compilation), both championed by the Lounge Records folks and recorded at their own Deep Space Recording Studio. Of course, the modern space/psych combo Asteroid #4 are the very same guys and they have their own collection of five new tracks, released in conjunction with the AIP label in California. 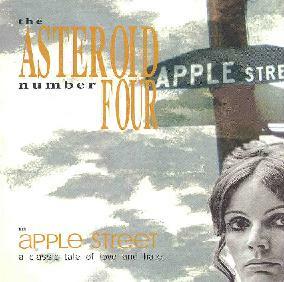 I'm afraid I missed the modern explorations that the A#4 sought out on their debut, as I found 'Apple Street' far too 60s-ish to be of much interest to me. I suppose that's a matter of personal taste, as if they had done a similarly thing with early 70's psychedelia, I probably wouldn't complain so much. For me the problem is that the rhythm guitar is intentionally made to sound thin and ching-changy like so much of the pre-Marshall stack classic era. Accordingly, "King Richard" could very well be a lost track from The Who, but well before 'Who's Next' came a'callin'. "Poor Man's Falls" is an acoustic guitar and flute ballad, rather pleasant while somewhat superfluous. OK, I'm going to waffle a little bit because while shamlessly retro and silly, "Local Fashion Junky" is quite superb. The hand claps as percussion, the mean harp palying, the farfisa organ, and the shimmer-guitar - they really lay it on thick... it's so stupid, it turns out really fabulous. But it's not enough to save a weak overall showing. I can only hope that their blast into the past was a off-track bit of fun, and won't become their modus operandi. Asteroid #4 have too many good modern ideas to warrant jettisoning their original approach (as on their debut 'Introducing...') in pursuit of the Elephant 6-style hipness factor. The buzzing-drone hidden track at the end is more like the sort of modern statement I am always on the lookout for, but this was just a tangential surprise ending I presume. The compilation actually begins with the quirky retro-psych offering from the Three 4 Tens ("I Feel Fine"), better than what I remember from their EP debut and a little like a Stewart Copeland-penned Police tune. Two more 'old-style' psych numbers appear in "Here Comes Some Changes" (Photon Band) and "Sids" (Lenola). Solid enough performances, but not really my bag so much. Aspera Ad Astra's "Give 'Em Back" is a fine piece of work (U2 does space rock? ), so laid back and innocuous to start, but then climaxes in a lively jam. Of the two more experimental numbers, I prefer the attempt by Bent Leg Fatima ("AO"), an extended multi-phase excursion with lots of interesting sounds... Azusa Plane's "Drinking Scotch with Delmore" was more like hearing footsteps overhead at a Chinese folk music performance. Intro to India's "The World is Melting" is a very shoegazey number (a la Slowdive, old Verve) and a pretty good one at that. The finale is Asteroid #4's own contribution "Tricks of the Trade," which is far better than anything on their own EP, a Beatlesque pop tune in 6/8 time colored with multiple layers of echo guitar and a sonic freakout ending. To my mind, there's no doubt which of these is the preferable commodity...the Psychedelphia compendium is a really stong statement that southeastern Pennsylvania is a hot-bed of both retro-reinventors and (more importantly) some forward-thinking artists. I'm not sure why the Asteroid #4 chose to take a look all the way back to the 60's for a spell there, but I imagine that this EP might have been just a little something to bide their time until coming up with the next new direction to take. For more information you can visit the Lounge Records web site, and the AudioInformation Phenomena web site.